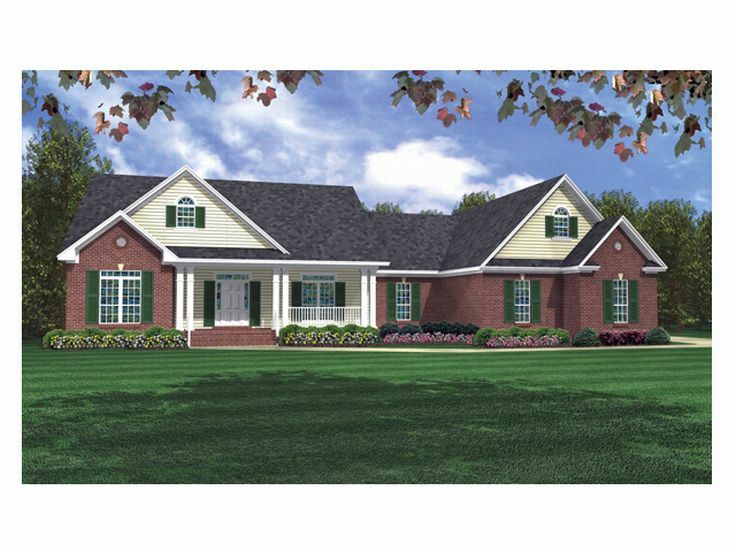 From the siding and brick façade paired with front facing gables to the charming dormers and column lined, wrap-around porch, this ranch house plan displays a masterful blend of country, traditional appeal. 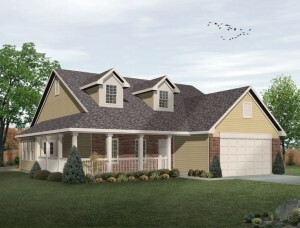 Ideal for those stepping up from a starter home, this one-story floor plan showcases a bedroom together design with three bedrooms neatly clustered together at the back of the home for privacy. This thoughtful layout ensures everyone will get a good night’s sleep with the parents sleeping nearby the children’s rooms. The master bedroom showcases a fanciful tray ceiling, large walk-in closet and pampering salon bath outfitted with a soothing garden tub. 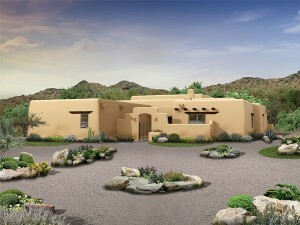 Sunny windows fill the family bedrooms with natural light, and a convenient hall bath accommodates the children’s needs. The main living areas team up to promote easy and relaxed living. 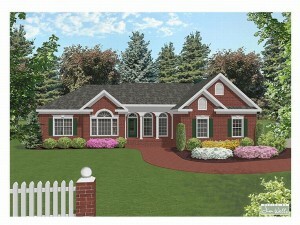 Open and spacious, the living room accommodates everyday happenings and large gatherings for special occasions. The kitchen reveals an efficient, step-saver design with practical features like ample counter space, a pantry and a breakfast bar pleasing amateur and gourmet chef’s alike. If outdoor cooking and dining is what you prefer, take a look at the rear patio, a great place for grilling, summertime barbecues or dining alfresco with the kids. Laundry chores and unloading groceries are a snap with the kitchen strategically positioned near the 2-car garage and laundry room. 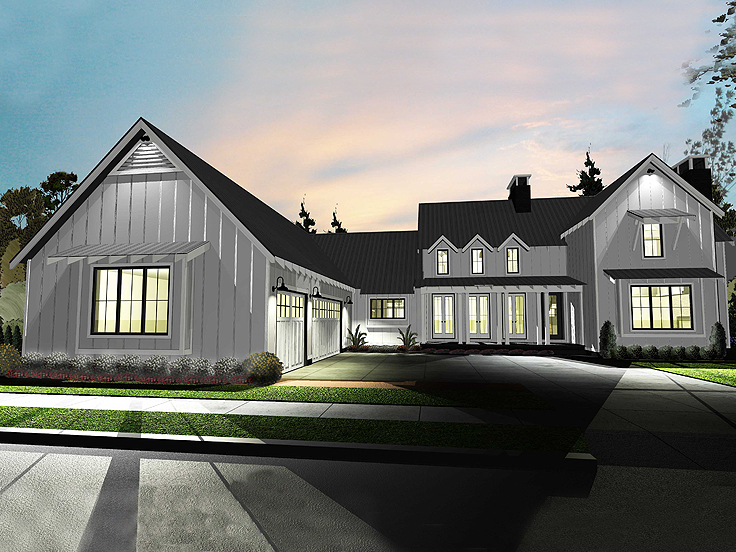 If you are looking for relaxed and stylish family living all on one level, this one-story ranch home plan is sure to get your attention. 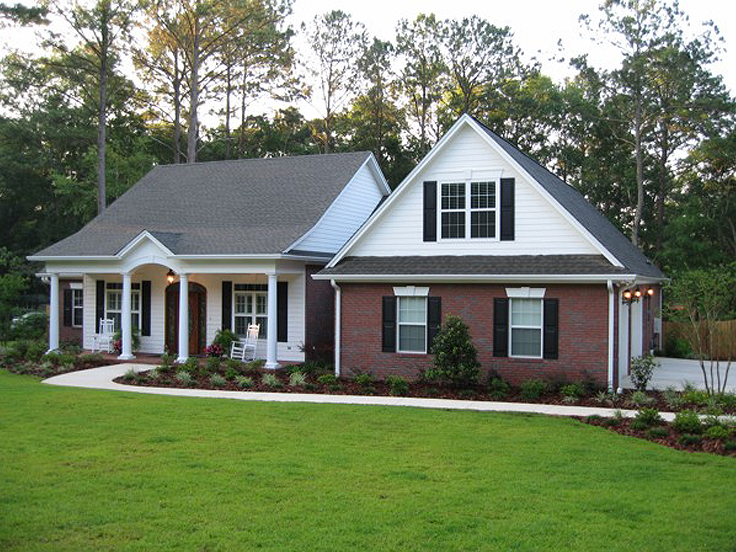 Browse more ranch home plans at The House Plan Shop.